Are you sitting comfortably? I’m going to tell you a little story about how wear it pink came to be. Way back in 2002, we decided to create a special day during Breast Cancer Awareness Month in October. We would be united by wearing the colour that symbolises breast cancer: pink! Although millions of people dedicate their wonderful time and effort all year round, it really shows the incredible impact across the world when thousands of people do something on one day. 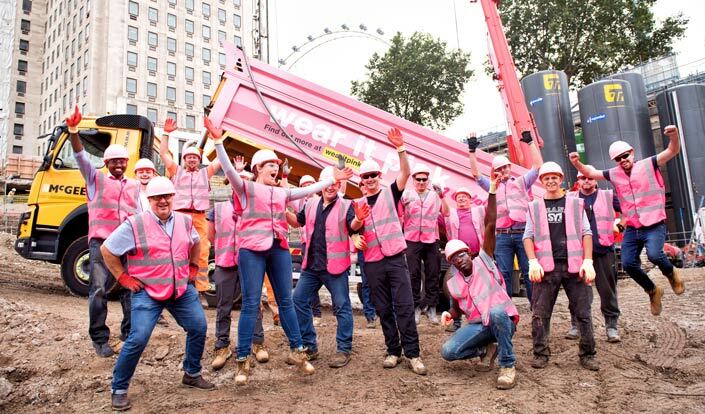 So incredible in fact, that wear it pink has raised a total of almost £30 million so far. Read more about wear it pink in our about section. We’re coming to our fifteenth year now, which means that we’ve already had an incredible 14 years of cake sales, pink wigs, head shaves, raffle prizes, coffee mornings, custard pie throws, back waxes, sweepstake wins, heartfelt hugs, extravagant recipes, targets smashed, thoughts for Mum, pink champagne and of course, wearing it pink. "Fabulous event having the whole school take part enabling the children to understand the reasons behind the research and what it’s used for." Wear it pink has become a regular event on the tennis club calendar – playing in pink tutus, feather boas or pink wigs is particularly popular with the men! Breast cancer has affected the lives of many and continues to, funding is essential for research into new treatments and cures. I’ve seen first-hand a family member given the all clear from breast cancer due to the treatments available. Our students remember the day and many know that it is coming up each October, one student asked me ‘What day am I going pink this year? All for PINK and PINK for all! Want to see last year’s supporters in their pink gear? Take a look at our 2016 gallery. We’ll wear pink for our scientists’ incredible discoveries, future advances in medicine, for our lovely mums in treatment, for our fabulous aunties in remission and our wonderful sisters who we miss each day. We will wear pink so show how powerful we are, to host brilliant parties to share with friends and co-workers, to teach our children and students about how they can make a difference.